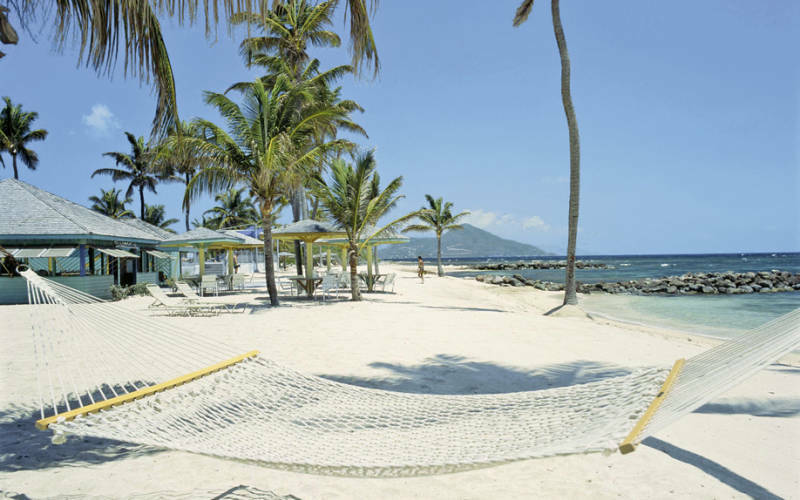 The luxurious Nisbet Plantation Beach Club on Nevis’s north east coast has come a long way since Fanny Nisbet lived here. Indeed, I’m sure Britain’s naval hero Lord Nelson must have been quite taken with it each time he came to visit while he was wooing Fanny before marrying her under a giant silk tree on the island. Mind you, as most of the Nisbet team have been here for so long, it wouldn’t surprise me if they were on first name terms with the famous old Admiral. Angella greets me at breakfast down at Coconuts restaurant right on Nisbet’s private beach. In my head I’m trying to work out just how many breakfast servings that might be, but give up and just call it a hell of a lot. I sit at a window table enjoying the early morning sea breeze as a pelican glides lazily past, circling the pool and the Caribbean beyond searching for breakfast; two egrets stand motionless in the long grass below my window, a tiny monkey chases up a palm tree and I’m having perfect scrambled eggs and great coffee. I’m thinking life certainly doesn’t get much better than this. 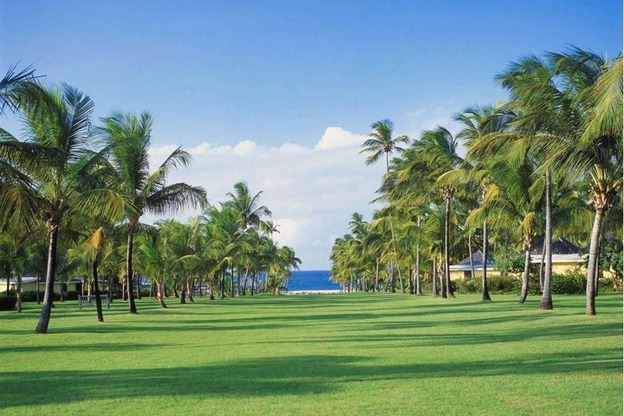 Coconuts beach restaurant lies at the far end of a glorious avenue of palm trees framing the way down the lawns from the Nisbet Plantation Beach Club colonial Great House, all the way to the beach. A truly spectacular setting, the only plantation destination in the Caribbean with its own private beach front; the rows of sugar cane now long gone in favour of perhaps more glamorous rows of luxury bungalows. Nevertheless, the colonial feel is ever present, a remarkable nod to a time when old school graciousness and good manners prevailed. For me there is something heartfelt and warming when you stay somewhere where everyone knows your name and you know theirs. 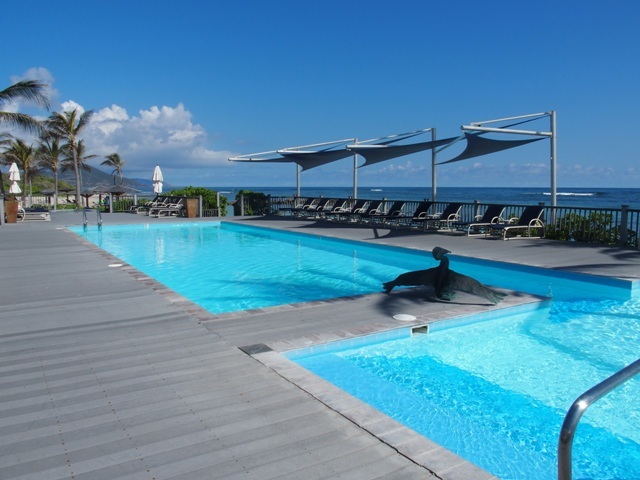 It’s simply a world away from faceless big brand international resorts. 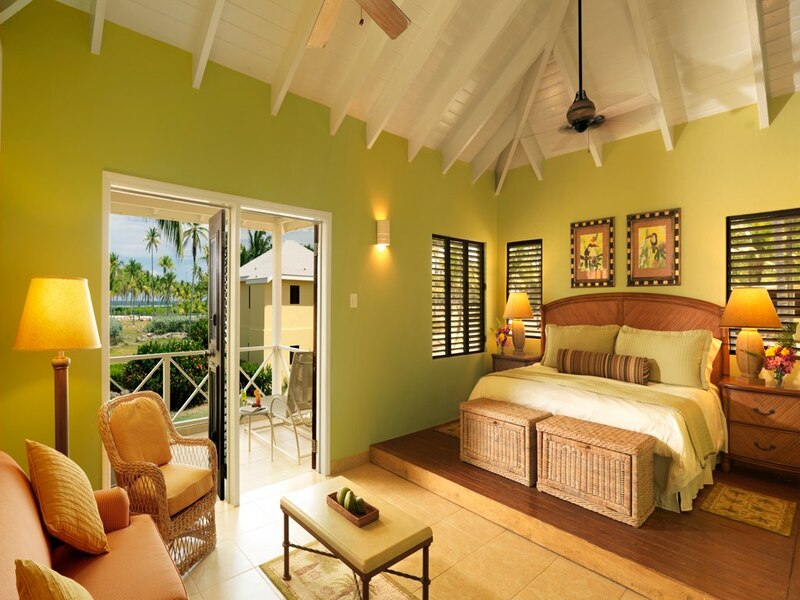 There are just 36 colonial style cottages at Nisbet Plantation Beach Club ranging from superior rooms closest to the Great House to upper premier junior suites down close to the ocean. All the airy cottages have traditional Nevisian white wooded roofs with vaulted ceilings, king-size beds, granite and porcelain bathrooms and spacious patios or balconies with ample land around each. There’s free wifi, tea and coffee, air-conditioning of course and a whole cast of wild life characters whose choral activities will be an ever present accompaniment to your stay. I spend most of the day working off breakfast and lunch in a hammock on the beach, interrupted a couple of times by Petronella bringing me some iced water and a cold towel in-between glasses of Nisbet’s famous rum punch and a club sandwich or two from the beach bar. Walking back to my ocean front cottage I hear singing coming from my room. A moment’s panic sets in before the door opens and the singing abruptly stops as my intruder appears. My housekeeper, Pearl. 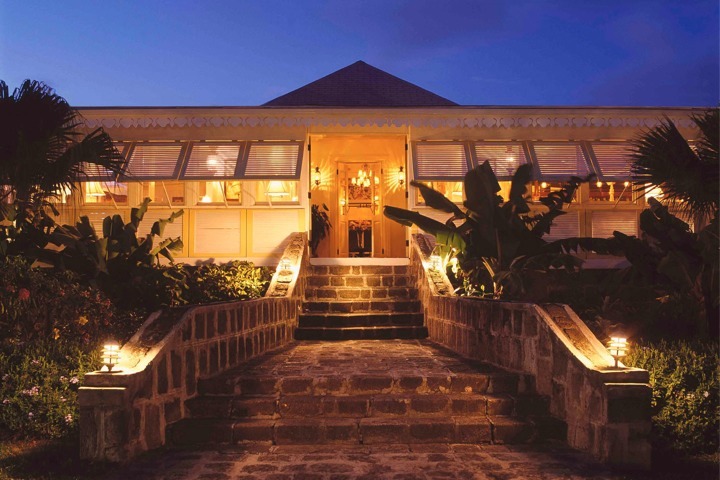 As evening arrives, I join my fellow guests as we make our way to the Great House for cocktails and dinner, the small flashlight on my room key lighting the way across the lawn to Nisbet’s four diamond-rated restaurant. 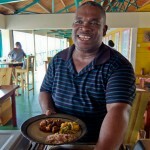 Maitre d’ Patterson, another member of the Nisbet Plantation Beach Club double decade club, is a dining tour de force; almost a Nevis legend some might say. Well he would say at any rate. Patterson’s patter is very infectious, always upbeat and very endearing, particularly with ladies of a certain age. Perhaps I’ve stepped back into the 19th century as the cocktail crowd adorn the Great House bar with its wicker chairs and varnished wood floor; hotel regulars Graham and Beth from Surrey, John and Kate from Chicago, and fifth timers Celine and Jeff are making light work of the canapés and drinks as we all discuss the merits of Nevis’s second Blues on the Beach Festival that’s just taken place along the coast at Oualie Bay. 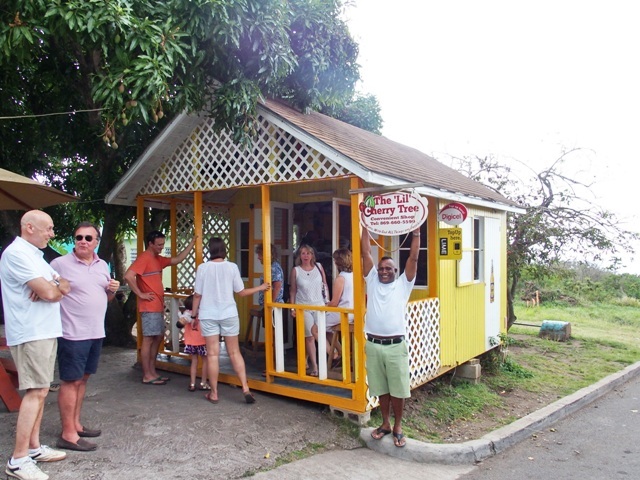 The brainchild of two Englishmen, It’s an ambitious 3 day project to attract tourists and offer the locals a chance to enjoy music somewhat different to their traditional reggae and calypso leanings. On the nights I was there, I really enjoyed the music, some highly talented artists, but more entertaining for me was watching the locals try to understand blues music. After a few rum punches it seemed the translation got a lot easier. Patterson appears and sits me out on the terrace for a 3 course dinner at a very reasonable $65. I picked a sautéed trout snapper and bean thread noodle stir fry, followed by chicken breast with mash and marsala wine and mushroom sauce and a chocolate pudding with ice cream dessert. It is excellent fare, perfectly in keeping with Nisbet’s personality; smart and upscale without being pretentious or stuffy. 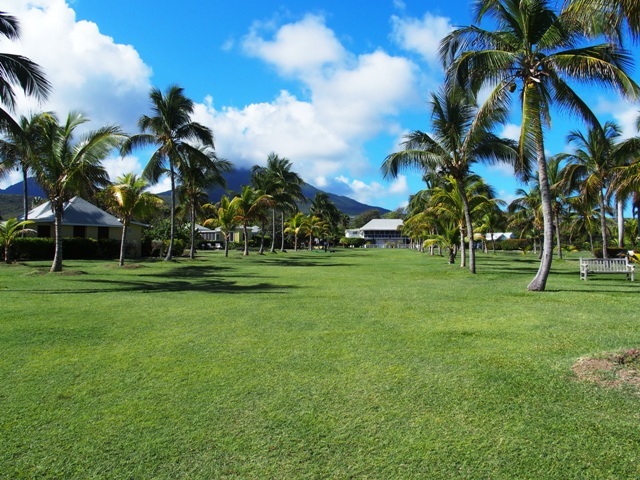 Nevis is a small island, much smaller than its big sister St. Kitts just a 6 minute water taxi away. There’s not even a set of traffic lights here. But what Nevis lacks in size it makes up for in charm and character. There are some truly beautiful coastal views, some stunning beaches and enough places to visit to keep you interested. It’s the kind of place where everybody knows everyone else and no one knows more people than Patterson of course who, once a week, takes Nisbet guests on a island bar crawl; visiting hidden shacks only the locals know about. As I board the bus, I spot Graham and Beth and John and Kate looking very keen to sample some of the local brews. By the time we hit the Octagon bar in Nevis’s tiny capital Charlestown, Graham and John are well on the way to becoming token Nevisians for the day, downing just about everything Patterson throws at them. Behind the bar is Jippy, a man with only 4 teeth, a frayed vest and a big smile. “Man, you just reminded me” he replies “I haven’t had breakfast yet” as he pulls down a bottle of tequila and a bottle of beer, mixes both together and downs it all in one. Graham misses all this, he’s much too busy concentrating on making sure his rum actually reaches his mouth. The lil’ Cherry Tree Bar on the other side of the island is just a tiny shack with a counter serving hooch mixed with marijuana root from a gallon can. Graham has lost the ability to speak. Three hours later we arrive back to the welcoming embrace of Nisbet a little worse for wear, but with plenty of stories to tell. 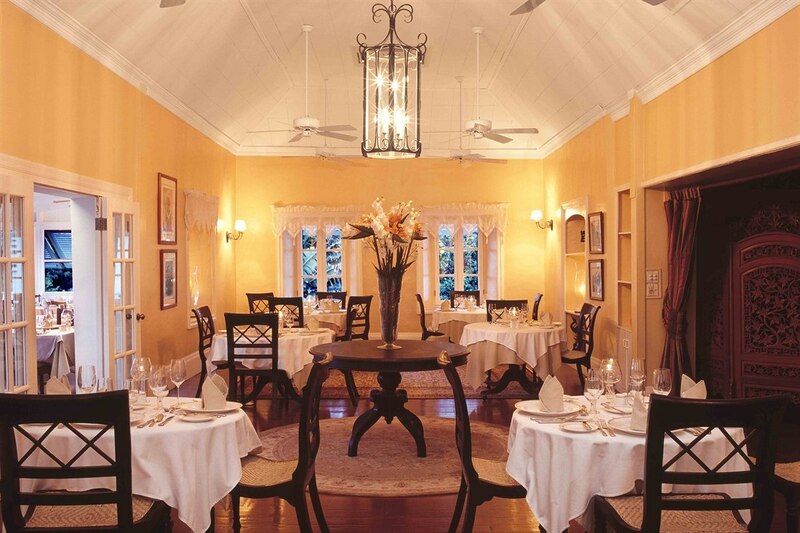 For me, Patterson’s bar friends give Nevis a real personality. We all head home for a well earned nap before emerging for the weekly Nisbet beach barbecue buffet, a night of food famous around the island and a steal at $65 including early evening drinks and a live band. The next morning and another sunny Nevis day. I want to do something on water and I’m told Lennox runs an excellent half day catamaran cruise. I’m taken to the dock by a taxi driver called Marlon Brando who doubles as a tournament golfer. I am not lying. And it is. Goggles and flippers provided, we explore the colourful marine life around the reef. Someone spots a sea turtle. Someone else, an eel. And there are lots of rainbow fish. A great day out. Lennox tells me he charges $60 for the cruise. “A very good price” I tell him. “I just want a home, not Rome” he tells me. Calvin (he tells me his surname is Klein but I’m dubious) brings me back to Nisbet. The words “too blessed to be stressed” are emblazoned across the back of his taxi. Back in time for afternoon tea on the patio of the Great House. I feel very colonial as I nibble on sandwich fingers and scones. Then I spot a small stone plaque tucked away in a corner niche; it’s a memorial to Fanny Nisbet, reminding me once again of a time gone by when romance was once in full bloom here. Well I’m not ashamed to say I’ve fallen hopelessly in love too and I’m rather pleased that the old Admiral and I both have something in common. 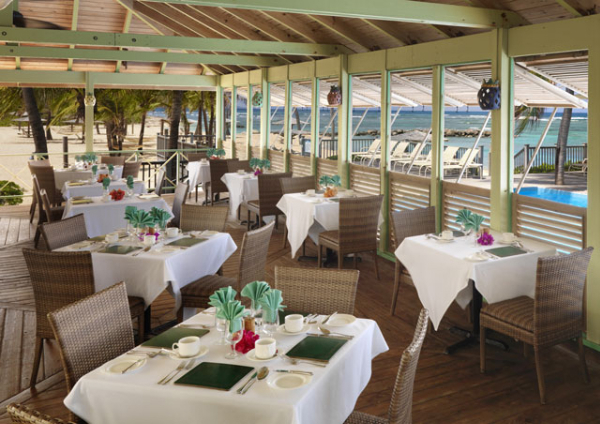 Nisbet Plantation Beach Club St. James Parish Nevis, West Indies Tel: (869) 469-9325 Fax:(869) 469-9864 Daily rates are from $495 for two people including breakfast, afternoon tea and dinner. 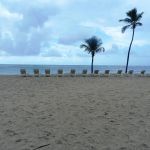 All external activities mentioned in this review can be arranged by Nisbet Plantation Beach Club. Images of Avenue of Palms, pool, catamaran and bar crawl (c) Colin Hockley. Anna Maria Island. 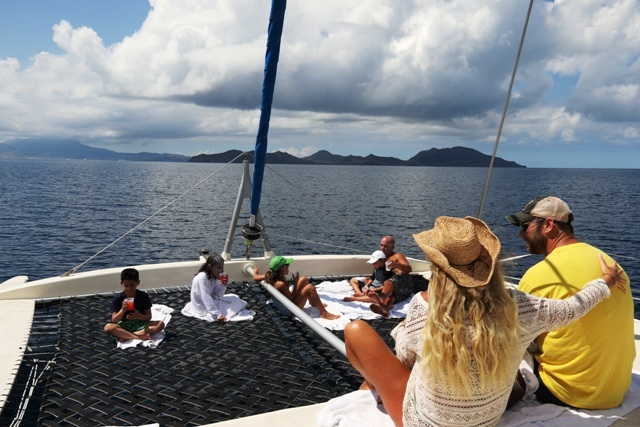 It’s like the Caribbean without the cost.